Sowter Transformer balanced ins and outs. Unique 2 channel clean mic. amps with 'Attitude' control. Option of 2 settings to select type of introduced distortion. 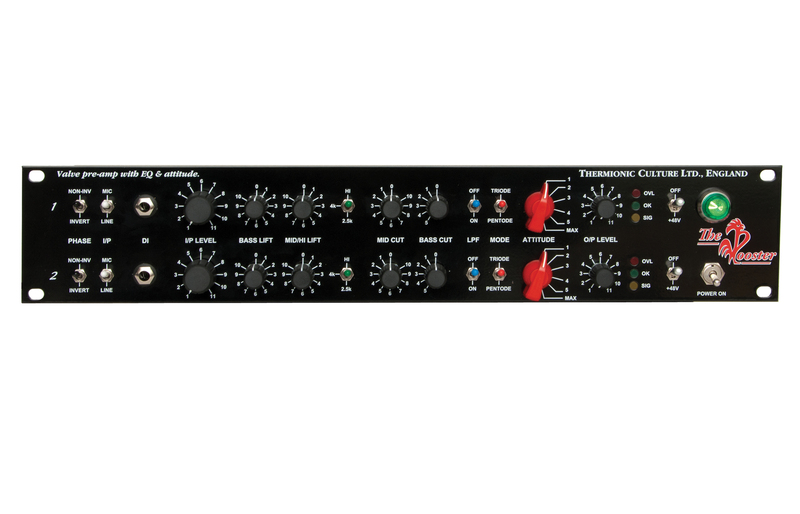 Versatile eq. with 'varislope' control of top and bass lift. 48v Phantom Power switchable to one or both. Phase invert switch on both channels. 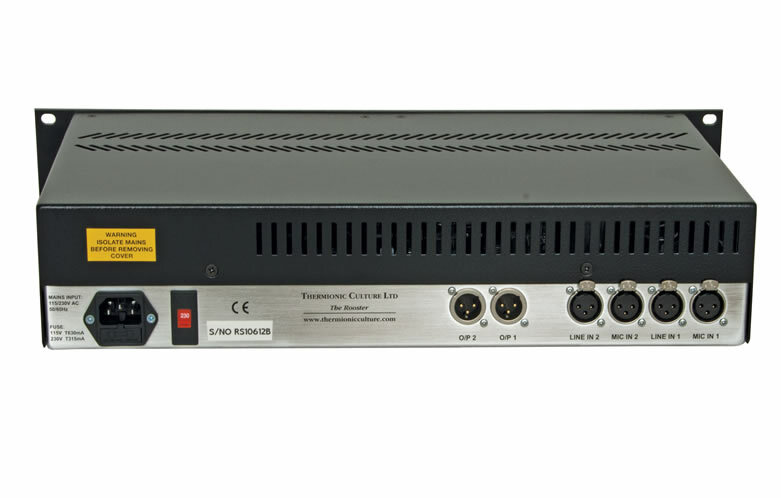 Low noise, High gain and High output level. The 'Attitude' section provides control over the amount of distortion inherently produced by the 5654 valve. 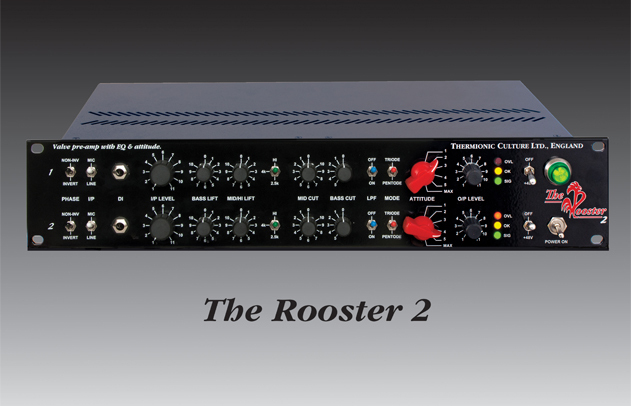 The natural distortion figure for the Rooster 2 is well below 0.1% at low Attitude settings. As the Attitude is increased, extra harmonics, mostly musical, will be added to give a warm 'valvey' sound. Similarly to the Culture Vulture, the unit will tend to produce predominantly more 2nd order harmonics when in 'Triode' mode and 3rd order harmonics when in 'Pentode' mode. This provides a creative means of both tone and dynamics control over the input signal as well as allowing the user to select how much and what kind of harmonics are present in the signal. The Bass lift control gives a continuous control over the amount of bass using a unique ' varislope' curve which peaks at 60Hz. The 'mid/high' lift control gives a bell type curve with variable gain peaking at either 2.5KHz / 4KHz or a 'varislope' curve peaking at 12KHz, all selected by the frequency select switch. The 'Mid cut' control provides a bell type curve centred at 700Hz with continuous control over the amount of cut. The 'Bass cut' switched control provides 5 positions with different cutting curves. The curves start off as high pass filters which get progressively higher in frequency and then turn into a shelving type curve that will also increase in frequency as the switch is advanced. These controls are intended to interact with the other EQ controls for a very flexible control over the entire frequency range. The 'LPF' or low pass filter switch control will allow the high frequencies to be cut at a frequency suitable to stop harsh sounding harmonics standing out when excessive distortion is used, smoothing the resulting sound. vPI © 2018 Thermionic Culture Limited. All rights reserved.